The 21 Day Fix plan has become one of the most popular workout programs and diet plans. Many people have tried the program; in fact, most people who have tried, have also succeeded in reaching their goals. 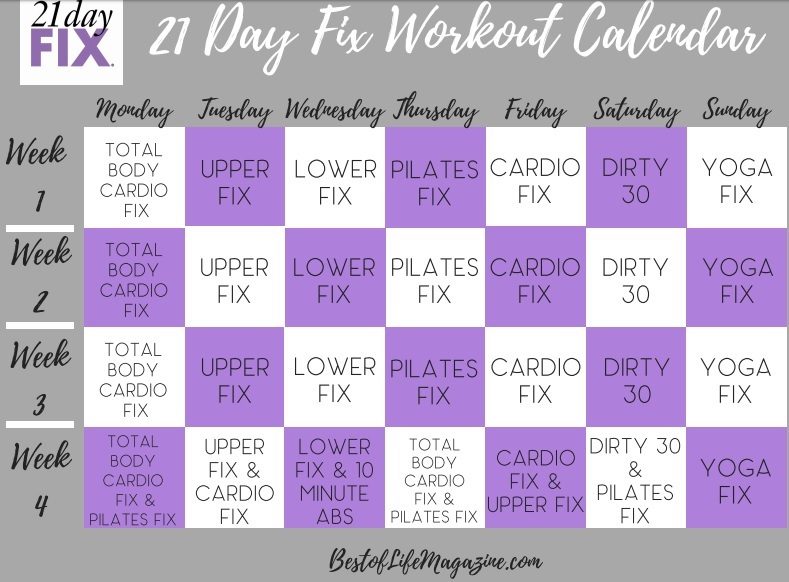 THe 21 Day Fix workouts have a specific order to them so in order to set yourself up for success, you should do them in the proper 21 Day Fix Workout Order. You should also know how to properly approach each workout. The goal is always to succeed, but if you go in knowing what to expect and tips to help, success will come sooner than you may think. 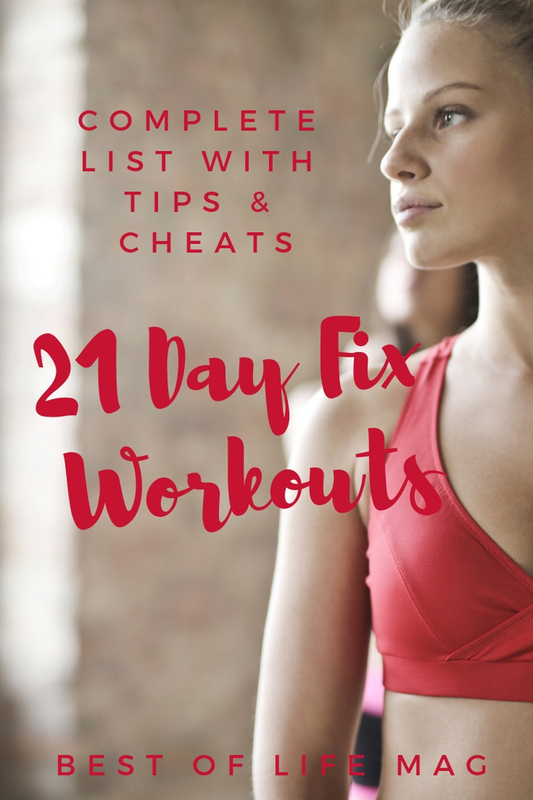 Get the results you want with this COMPLETE 21 Day Fix Workout order with a printable 21 Day Fix workout schedule and tips for each workout in the program. In order to have everything you need for success with your 21 Day Fix workouts, you will need the following: 21 Day Fix workout DVD’s, Beachbody on Demand is optional so you can stream, 21 Day Fix Portion Control Containers, Light weights, heavier weights, workout mat, workout shoes, and comfortable workout clothing. 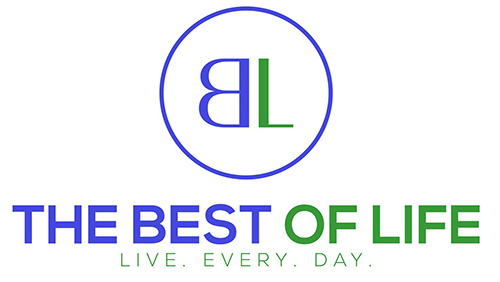 You will also want The Ultimate Toolkit for Success on the Fix! It’s super easy to download! There are seven workouts in the 21 Day Fix workout program and two bonus workouts. Knowing the 21 Day fix workout order will help! How Long are 21 Day Fix Workouts? 21 Day Fix workouts are 30 minutes which is the perfect length making them easy to fit into your day. The only workout that is not 30 minutes is the 10 Minute Ab Fix. There is a set order to do the 21 Day Fix workouts in. 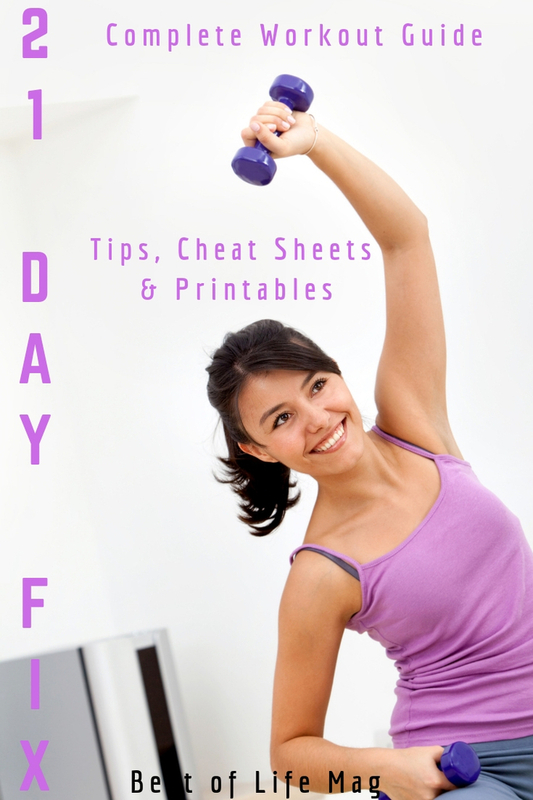 Use our PRINTABLE 21 DAY FIX WORKOUT CALENDAR to stay on track! Autumn Calabrese takes us on a journey of cardio discovery. Unlike most workout DVD sets, Total Body Cardio is fast-paced but slow going. Meaning, the workouts are great workouts, but they give a lot of wiggle room for those who need it. Some people say cardio isn’t enough, but if your goal is to lose weight and get back into shape, Total Body Cardio Fix is the perfect place to start. Read our full 21 Day Fix Total Body Cardio Fix review to get the most out of the 21 Day Fix workout order. Upper Fix workouts are, like most, 30 minutes long. There are 2 rounds and 5 exercises in each. The exercises are only a minute long and you also get a 15 second rest period between each one. As with other 21 Day Fix workouts, there are people on screen doing modified versions in case you need them. Read our complete 21 Day Fix Upper Fix workout review with tips and things to know. Ready to hit those legs, glutes, hips and even abs? Lower Fix focuses on your lower body for a total of 30 minutes. There are a lot of workouts in this set, unlike the Upper Fix but the same idea is at play. The goal is to do them fast and short but repeat multiple times until you get to 30 minutes. Throughout this workout, you’ll be doing different types of two basic exercises, lunges, and squats. Read our complete 21 Day Fix Lower Fix workout review with everything you’ll need to know before you get started. Many of us have heard of pilates, it’s nothing new. But then Autumn got her hands on the idea and turned it into something we all can do. This workout is meant to help our muscles work hard but also to focus on breathing. While Autumn does her best to make the workouts more consumer friendly, if you will, they still can get challenging. However, keep pushing through and do the best you can, over time, they will get easier and you’ll want more challenges. Learn how to stick with it in our 21 Day Fix Pilates Fix review and tips. Welcome back to cardio! While the TotalBody Cardio is a great workout routine, Cardio Fix is more intense. 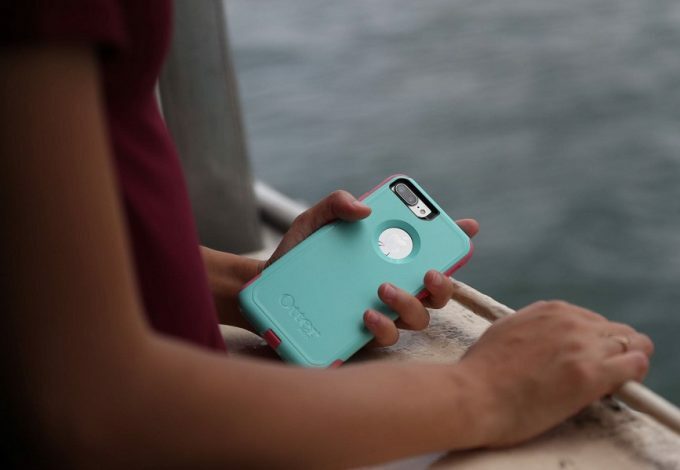 For this routine, planning is important and preparation is key. If you haven’t done any workouts before, you may want to take it slow. Even better, if you can do Total Body Cardio first, do it. There are 4 rounds with a bonus round that’s optional. Read more about the intensity of 21 Day Fix Cardio Fix and how to succeed with the best results. Don’t let the name fool you, 21 Day Fix Dirty 30 is for anyone who is willing to step up to the plate. While so far, most of the workouts have been focused on certain parts of the body or weight loss journey, this one is different. In fact, Dirty 30 aims to take care f cardio, muscle growth, dieting, and training. Another thing to note is that you will need weights, heavy weights to do the majority of the workouts in this plan. Read our full 21 Day Fix Dirty 30 Workout Review and our printable Dirty 30 Cheat Sheet will help, too! If you’ve never done yoga, you’re in for a great time. Most poses look easy and like they don’t do much. But when you get into a crescent pose and need to hold it for a bit you’ll feel the burn. Yoga not only strengthens your muscles, it also helps you practice good breathing and build up your core strength. 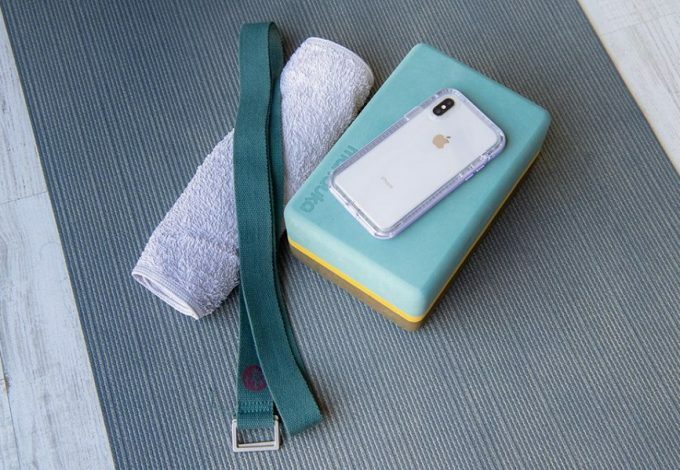 A great way to use Yoga Fix is as an “active recovery” workout to be done during the week after intense training. Learn how to use 21 Day Fix Yoga Fix properly and how to get the best results from your new plan. Another workout plan that you can add to the mix of other workouts is 10 Minute Abs Fix. This workout plan is not simple or easy but it is only 10 minutes a day. Given that it doesn’t take much time to complete this workout every day, it can easily be added to your life. The goal is in the title, help you build out your abs through core workouts. You don’t even need equipment, though a yoga mat or soft floors are recommended. Learn more about how to add 21 Day Fix 10 Minute Fix for Abs into your schedule and get started today. Plyometrics or jump training is high-intensity workout routines that can be done at home or at the gym. 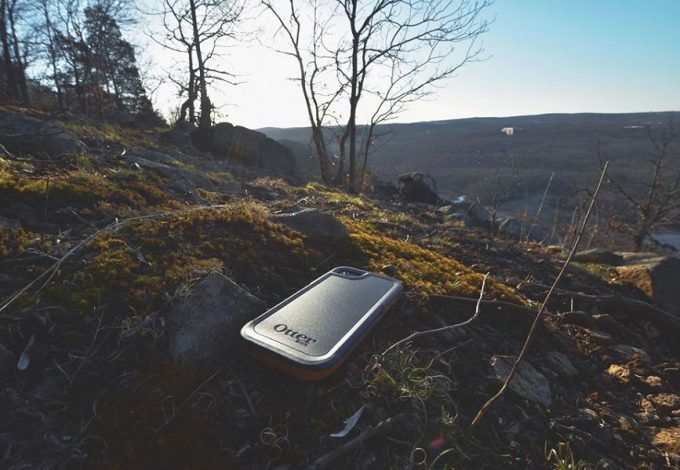 The reason for the name is because you will be moving, constantly, to keep your heart rate up and improve agility, strength, and coordination. This is another 30-minute workout routine but this time, there are 5 rounds with many different workouts. However, each round is short and face paced. Find out if you’re ready for the plyometrics workouts that make up 21 Day Fix PLYO Fix and then plan how you’ll succeed.